169 years of history have made ArtCarved the pinnacle of artistic design in the jewellery industry. Few designers can boast of the pedigree that ArtCarved considers its everyday business. At Damiani Jewellers, we are a link in this sesquicentennial tradition of excellence, thanks to our role as an authorized retailer of ArtCarved bridal jewellery. Offering both engagement rings and wedding bands from this esteemed designer made from the finest gold and most perfect diamonds, Damiani Jewellers is ready to pair you with pieces that not only meet your tastes and fulfill your dreams but exceed them. ArtCarved has several style collections that span the breadth of their bridal jewelry offerings. These collections include the Classic, Vintage, and Contemporary lines, which all orbit around a central design concept that plays out in every masterpiece that the designer produces. The Classic collection, for example, is typified by a timeless look that people think of when they contemplate “bridal jewellery,” such as clean curves, bold solitaires, and straightforward pairings of diamonds and the gold of the band. On the other hand, the Contemporary collection favours stylistically-bold features: twisted rope bands, two tones of gold, and sculpted heads with modern settings (think channel settings). Also, Damiani Jewellers offers the ArtCarved Vintage collection, whose bridal jewellery is clearly inspired by the Art Nouveau and Art Deco periods of the turn of the century. Delicate filigrees and scrollwork from the 1890s meet the strong, bold lines of the 1920s. These pieces are ideal for the men and women who’ve got that yearning for the past in their souls. 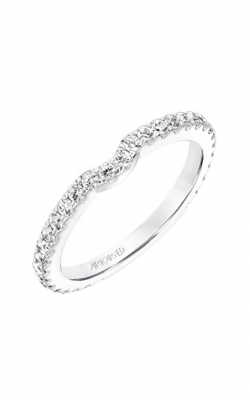 In addition, the ArtCarved men’s wedding bands also contain the Diamond and Engraved collections. The names explain the collections perfectly, with the former including a trove of stately diamonds; and the latter featuring bands with vine etchings and other elegant details, such as brushed gold, in their designs. Why Shop for ArtCarved at Damiani Jewellers? For over 60 years, Damiani Jewellers has proudly served the Greater Toronto Area. Thanks to our expertise in bridal jewellery, we’ve been an indispensable part of countless customers’ happiest days. 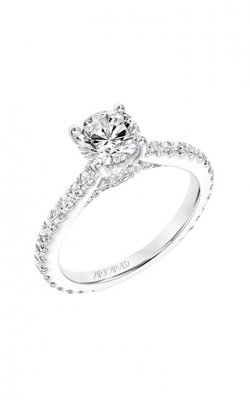 ArtCarved is one of the finest brands we offer, but we also showcase a wide variety of other atelier bridal designers, as well as fashion jewellery, Swiss-quality timepieces, and GIA-certified diamonds. We aim to be a facet of our customers’ lives for decades, so don’t forget that that Damiani Jewellers offers full-service maintenance and repair. Also, if you’d like to see your dreams for custom jewellery become reality, we employ a three-step design process to perfect your vision.